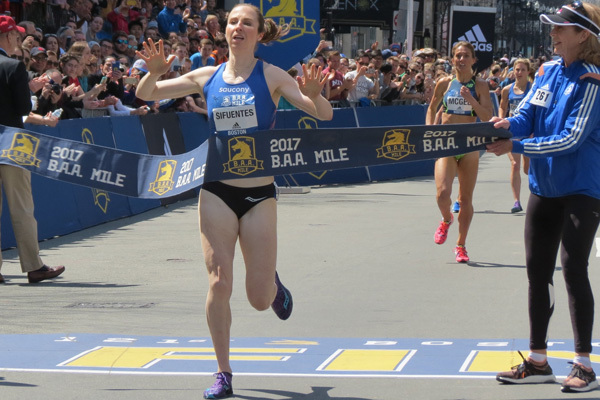 Nicole Sifuentes breaks the tape in course-record time at the BAA Mile. Photo by Jane Monti/Race Results Weekly. Nicole Sifuentes left no doubt about her intentions at today’s BAA Mile, taking the lead at the start and never conceding it en route to a course record of 4:33.7. Local Cory McGee was a well-beaten second in 4:35.8. The previous event record was 4:35.4 by Dawit Seyaum of Ethiopia, set in 2015. You might not know it from Nicole’s time, but the BAA Mile is one of the slower road miles in the world. Its three-loop course around Boston’s Back Bay features tight turns and short straightaways before finishing at the line of a certain marathon that will be run on Monday. Next up for Nicole is the Drake Relays at the end of the month. 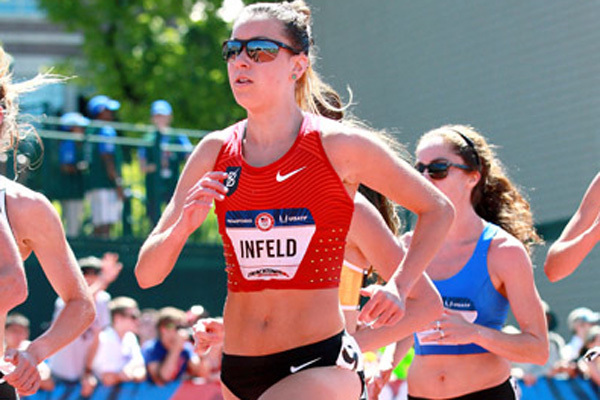 Emily Infeld made a rare off-track foray a successful on Saturday, taking second at the Gate River Run 15K in Jacksonville, Florida. The race served as the U.S. 15K championships for women and men. In the longest road race of her life, Emily set a personal best of 49:42. Jordan Hasay won in 49:28, and Neely Spence Gracey was third in 49:47. Those two are deep in preparation for next month’s Boston Marathon, making Emily’s season opener that much more impressive. “Starting to like these longer distances but excited to be back on the track for some 5k/10k action,” Emily wrote on Instagram after her race. In the men’s race, won by Olympian Leonard Korir in 43:22, German Fernandez was 14th in 44:57 and Sean Quigley was 20th in 45:33. 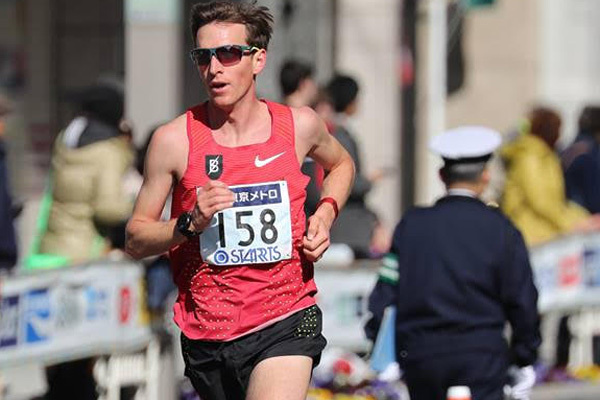 In his debut at the distance, Andrew Bumbalough ran 2:13:58 to place 25th at the Tokyo Marathon on Sunday. The race was won in an event record of 2:03:58 by former world record-holder Wilson Kipsang. Andrew met his goal of having his first marathon be a controlled learning experience. Before the race, he had said he’d be happy with a time between 2:11 and 2:14. He passed halfway in 1:06:15, then slowed over the second half, but never disastrously so. Mission accomplished! Andrew’s road to a marathon start line was longer than originally planned. His 1:02:04 half marathon PR in March 2015 was to be the first step in a build-up to the Olympic Marathon Trials in February 2016. Soon after that race, however, Andrew began to be plagued by what was ultimately diagnosed as a sports hernia, which required surgery in the summer of 2015. In 2016 he missed more time owing to a sacral stress fracture. He resumed running last July, and in November showed he was the Andrew Bumbalough with a 28:06 track 10,000. Andrew now plans to recover from Tokyo before building for a summer track season. Serious note though. Truly thankful to be back at it. There was some good and bad out there but fortunately it never got ugly! 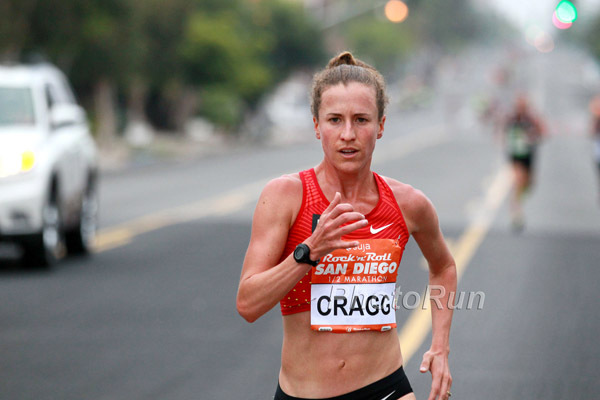 Amy Cragg took almost a minute and a half off her half marathon personal best on Sunday, running 1:08:27 to finish second at the Marugame International Half Marathon in Japan. Olympic marathon silver medalist Eunice Kirwa of Bahrain won in 1:08:07. Amy did a great job of pacing, hitting 10K in 32:21 and 20K in 64:56 (second 10K of 32:35). Shalane Flanagan was also scheduled to run, but opted not to start the race. She’s been having lower back pain, which was made worse by the long flight to Japan. The excellent blog Japan Running News has a full report on the race. 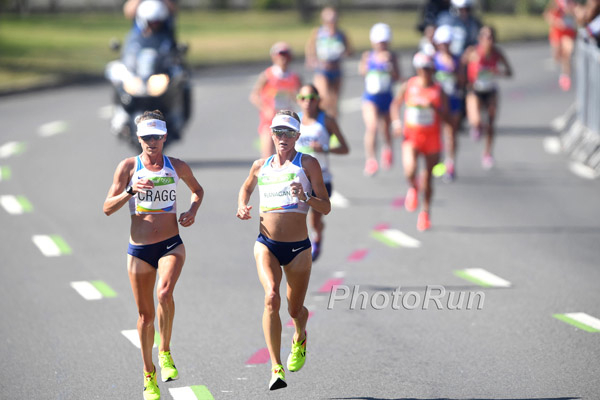 Training partners Shalane Flanagan and Amy Cragg gave it their all Sunday morning in Rio, and placed sixth and ninth in a warm, humid and sunny Olympic marathon. Shalane stayed with the leaders through 35K en route to running 2:25:26 and placing sixth, four positions higher than she finished at the London Games in 2012. Amy and Shalane ran together throughout the first part of the race, until Amy lost contact between 25K and 30K. After slipping to 11th place at 40K, Amy fought back over the final mile-plus to move up to ninth, in 2:28:25. With Amy’s college teammate Desiree Linden finishing eighth, the U.S. squad had the best showing ever by an American team in the women’s Olympic marathon.